The necessities: ID, cash, credit cards...because you clearly won't get far without them. COVERGIRL Outlast Illumina lip color: I have a confession to make. I'm pretty awful at checking my lipstick for touchups, especially for evenings out. It somehow always slips my mind and before I know it, I'm taking my makeup off at the end of the night, wondering how long my lips were left looking like that. I know, I know. Blasphemy. But! I think I've met my match. This duo by COVERGIRL is the perfect night out pair in that the color lasts up to 24 hours, thanks to the topcoat gloss that locks in extra moisture. Just a few little swipes of the topcoat (in between cocktails) and I'm good to go. Spare earrings: Just in case you need to add a little sparkle to your look. 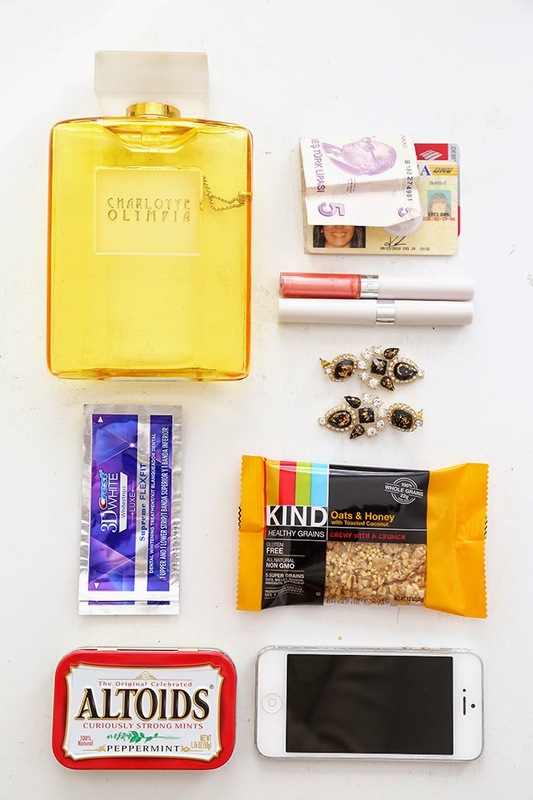 Kind granola bar: I started bringing snacks with me for evenings out just in case I don't have time to grab something to eat before heading out. Granted, it definitely doesn't substitute a full meal before drinking, but it does help tide me over until I sit down and eat a proper meal (or get late night french fries, whatever comes first). Crest 3D Whitening Strips: Lately, I've been packing these in my clutch to throw on before heading out (generally an hour before). And in case you're just joining now, you can see my other bag edits here and here. This post was in collaboration with Lucky Magazine, COVERGIRL and Crest. As always, all opinions and styling are my own. Thank you for supporting posts that keep This Tim. Tomorrow's doors open! I've been reading your blog since years ago when you were taking photos in your apt XD I'm too old to try and do what you did (work for Google? Travel the world? Attend FW? ), but I'm always in awe of how much time and effort you put in, and how things worked out. I love your clutch and I have to try the Covergirl glosses! I carry spare earrings as well! omg the crest white strips!! I'd love to smell it! Love this bag edit and like you, over the years I have had to learn how to pack a mini-bag! You should get a small card holder for your ID and card so they are note swimming around in your bag. Kind bars are essential. The cherry and dark chocolate almond blows anything and every other bar out of the competition. Love the bag picks! It´s amazing how much things women put in bags and always can have everything at hand, I suppose that we men are not very organized. Mexican clutch bag uses mayan paterns and organic materials, and also are very useful.